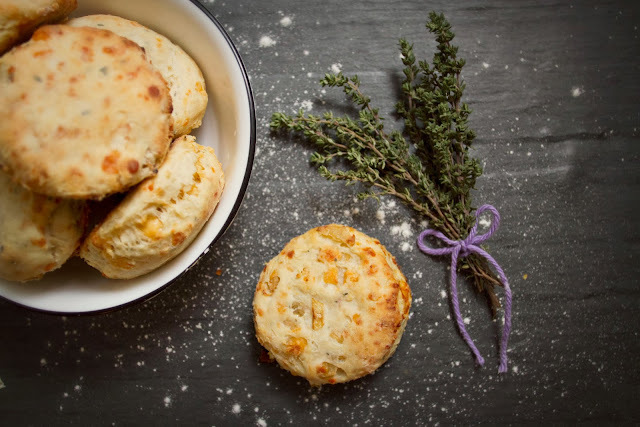 Fresh, green, herbal thyme, sweet caramelized onion, and nutty, cheesy aged gouda- these biscuits have it all. I baked them up on a cold, grey weekend recently, and the house smelled heavenly for hours. Cheesy biscuits were one of my first endeavors when I began baking savory treats, anything you can put cheese on, I am interested in. 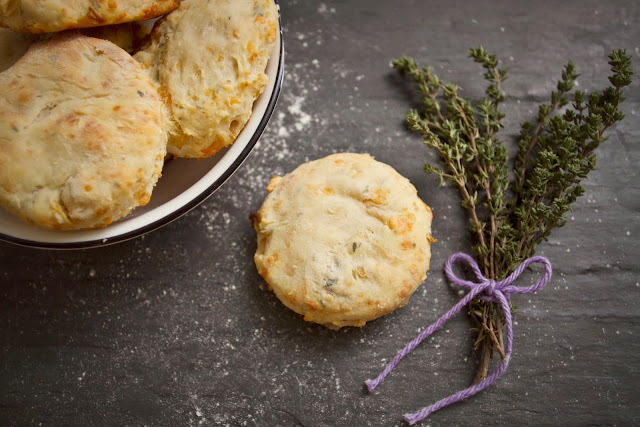 When I lived in Olympia I would make big batches of cheese biscuits, experimenting with cheese types and fresh herbs from our lush, overgrown garden. They added a bit of warm, cheesy luxury to the damp, dreary winters of the Washington. I woke up in a grey, chilly Manhattan last weekend, longing for the dripping evergreens of the Northwest and craving cheesy biscuits. I decided to make a hearty, wintery version using aged cheese and sweet and tangy apple cider soaked caramelized onions. 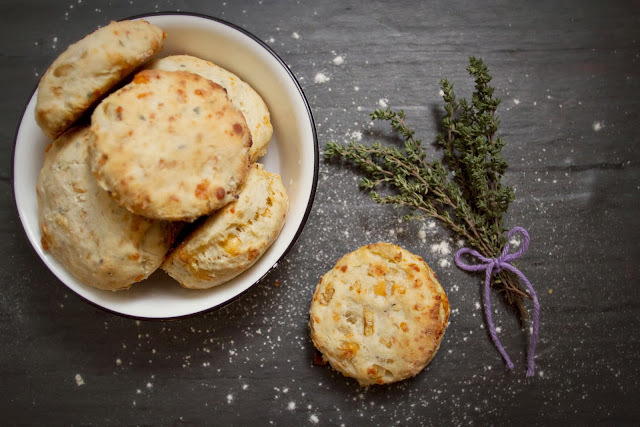 One bite of these biscuits, hot from the oven warmed the grey winter chill out of my bones, the pockets of melty, nutty gouda and bites of sweet, golden onions complementing the earthy thyme. 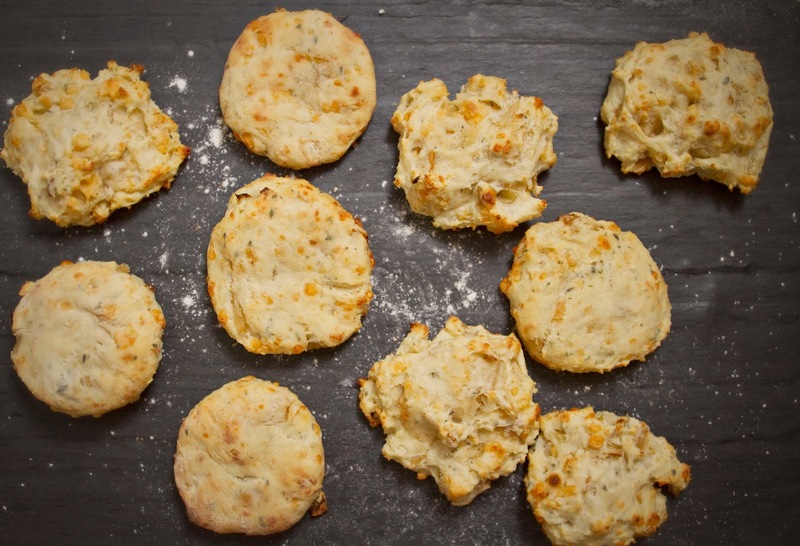 I made both drop and cut biscuits with this recipe, and both had their own perks. The drop biscuits were quicker to make, had more crisp edges and were a bit denser, while the cut biscuits were a bit more effort to make, but were lovely and fluffy inside with a lightly crisp outside that was fantastic. S and I devoured these dipped in creamy garlic soup, but I also ate them for breakfast and brought them to work as a snack, and they were heavenly every time. I imagine they would also be fantastic alongside roast meat, or a hearty stew, and I am certainly dreaming of scarfing them down for breakfast covered in sausage gravy. 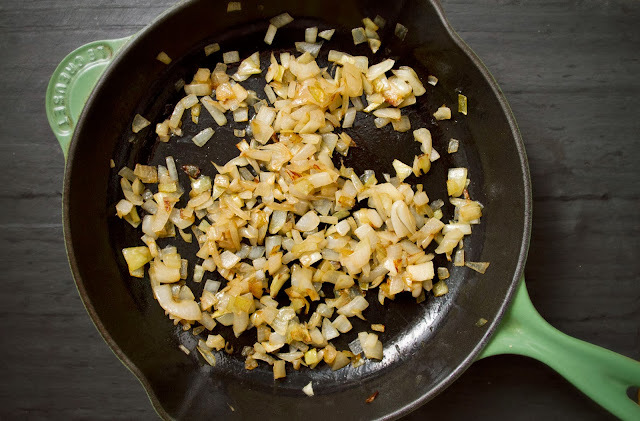 Chop the onion into small pieces about 1/4" long and place them in a skillet with the 1 tbsp olive oil. Heat over medium-low heat, stirring occasionally until onions are transparent, about 5 minutes. Add the apple cider vinegar and continue to cook until onions are caramelized and vinegar is soaked up, about 7 minutes. Remove onions from pan and place on paper towel lined plate to drain any excess grease. Cut the butter into small cubes and keep chilled, I place mine in the freezer for a few minutes. 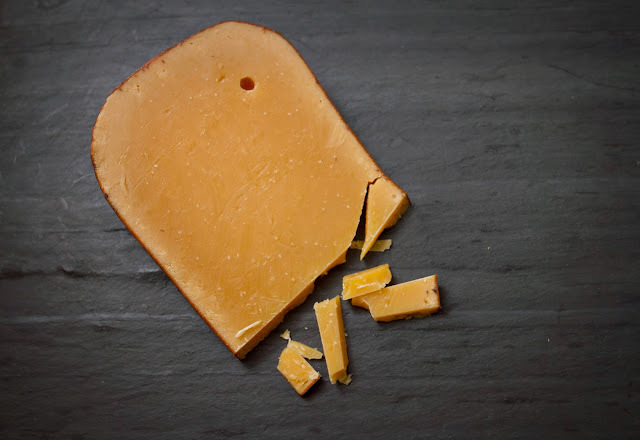 Grate gouda into fairly small bits, I found a food processor helpful for this part, just cut the cheese into cubes and toss it in, blitz until the cheese is pretty well chopped. 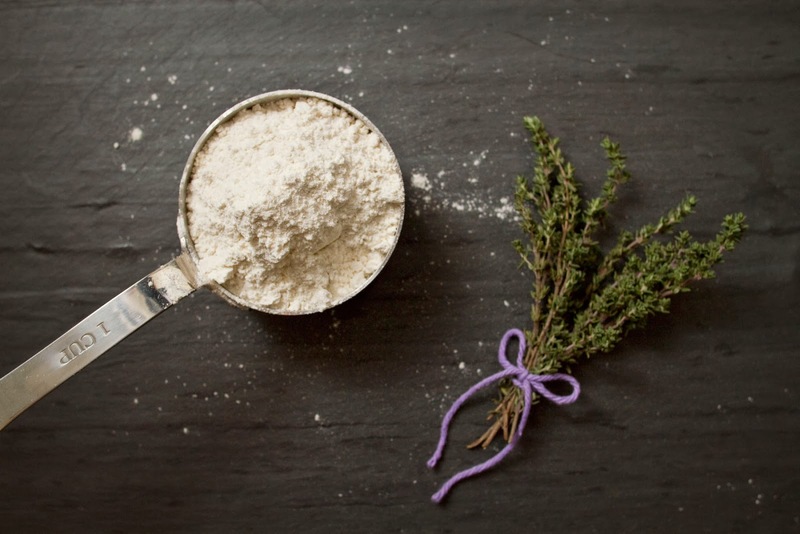 In a medium bowl whisk together flour, baking powder, baking soda, and chopped thyme. Work in the cubed butter with a pastry blender or your fingers. Cut in the butter until mixture resembles coarse crumbs and butter pieces are pretty small. Stir in the cheese and onions. In a small bowl combine the milk and sour cream, stir it into the flour/butter mixture. 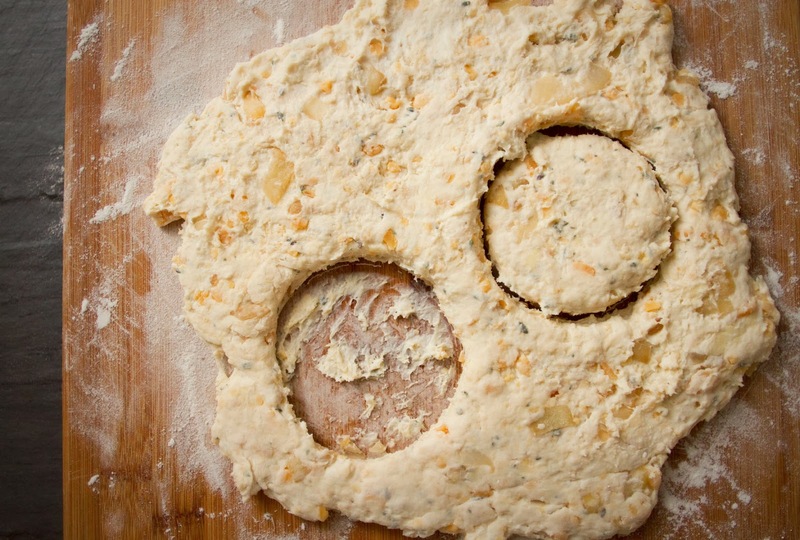 Mix until just combined, then with well floured hands knead a few times. 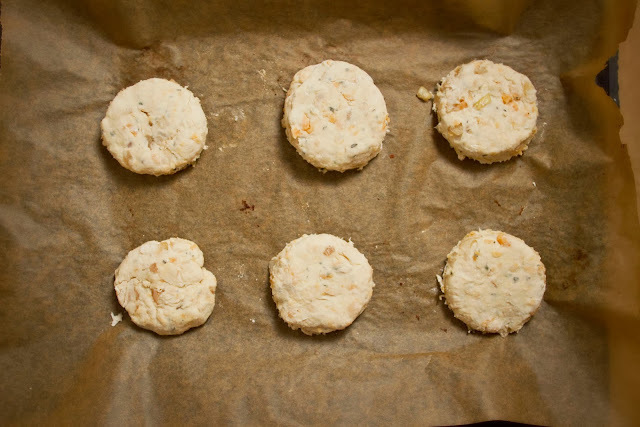 If you wish to make drop biscuits scoop them with a spoon onto a parchment paper lined cookie sheet. For round biscuits turn the dough out onto a well floured surface and using floured hands pat it to about 1 inch thickness. Use a glass, cookie cutter, or knife to cut the dough into desired shapes, and place at least 1 inch apart on a parchment paper lined cookie sheet. Bake for 12-15 minutes. Eat immediately or allow to cool, they're delicious either way!